Mid-Autumn Festival 中秋节 is celebrated on the 15th day of the 9th lunar month when the moon is supposed to be at it’s brightest and fullest. 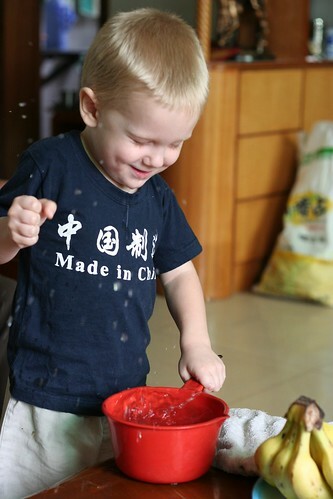 It is a time when farmers celebrate the end of the summer harvest. The legend that accompanies this holiday begins when beautiful Chang’e took an immortal pill and was exiled to the moon. This forever separated her from her mortal husband, Houyi the archer, who loved her so much that he couldn’t bring himself to shoot down the moon. Their separated love adds a romantic undertone to this holiday. 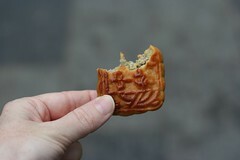 Late at night couples enjoy gazing at the moon and eating mooncakes. The legend of the mooncake began during the Yuan dynasty (A.D.1280-1368) as a secret plot to overtake the Mongolian rulers of China emerged. 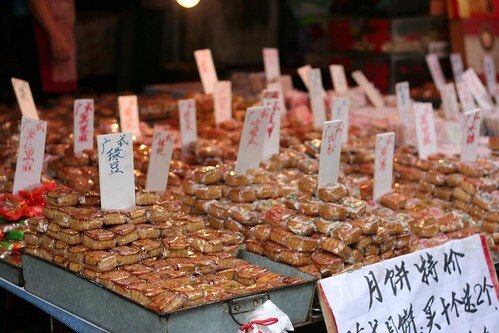 The creators of the rebellion cooked special cakes to celebrate the coming Moon Festival, but the cakes contained special instructions for the overthrow of the government. It was successful and the Ming dynasty (A.D. 1368-1644) emerged. Today, mooncakes are bought and given away to friends and family. In some department stores, you can see specially packaged mooncakes costing hundreds of dollars. The Guangzhou style which are baked into a lovely pattern. 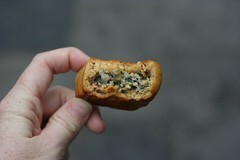 And the deliciously flaky Suzhou style. 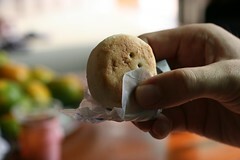 Mooncakes have many different fillings. The some of the “fruit fillings” taste like old time gum drops. Not too great. 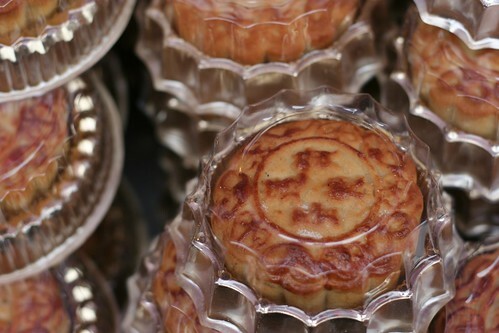 Some of the more expensive mooncakes have fillings with duck eggs to represent the round, full moon. There are also several meat varieties. 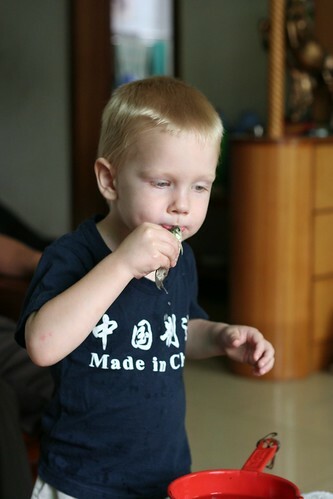 Schäfer loves mooncakes. We have to limit him to one per day. 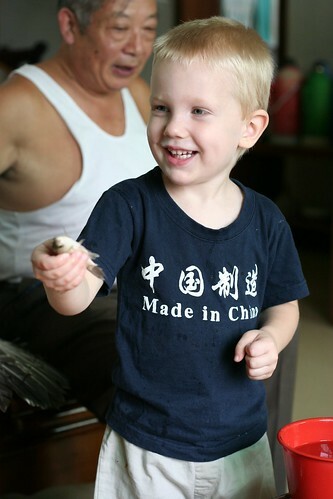 Ye Ye had just been to the countryside and brought back some small fish. 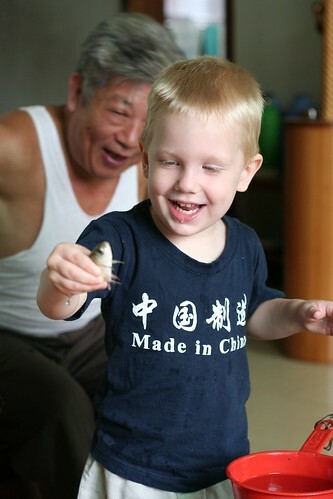 His family thought it would be fun to let Schäfer play with the fish in the living room. Schäfer loved catching the small fish. Grand Nai Nai told Schäfer to kiss the fish. So he did. 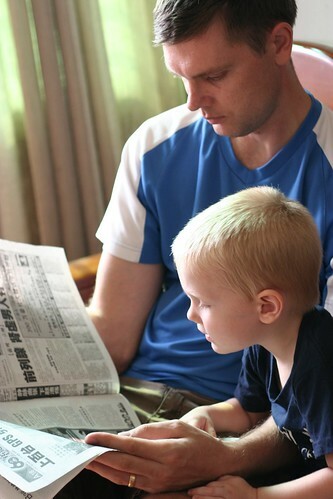 Hubs and Schäfer read the paper. 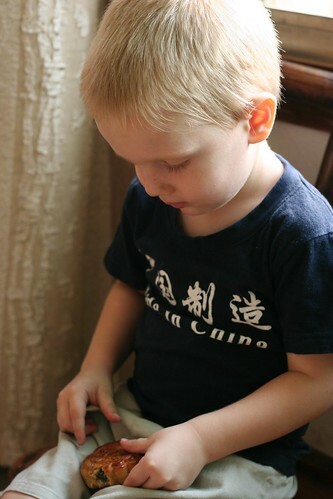 After we get back from our friend’s house, Schäfer went to sleep and we start baking a tomato and corn pie. Tonight, it’s 80 degrees outside and 84 degrees inside. That’s what happens when we turn the oven on! The campus has been surprisingly quiet lately. The 8 days vacation must have tempted a lot of students to travel! We’re having a little less karaoke outside our window at night. Another tradition on the Mid-Autumn festival is to go look at the full moon and send good wishes to distant family members who are also looking at the moon. 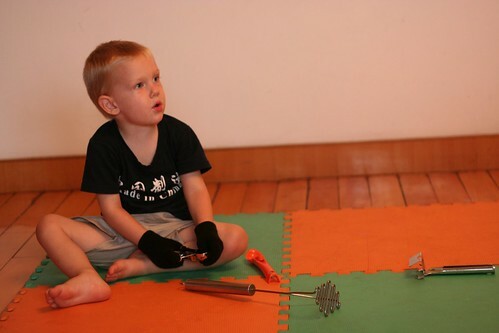 When we got to the roof of our building, I asked Schäfer what he wanted to say to his little sister and he replied, “A fork lift and a road roller!” Meaning he wanted to give her those toys. Thinking of you little one as we look at the moon.